For the just-beginning-to-read youngsters. 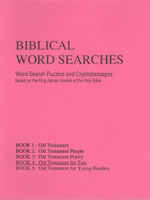 Word search puzzles and cryptopassages based on familiar, less familiar Old Testament passages. Most puzzles have a hidden message, revealed by solving the letter square. Photocopying recommended, to permit a lasting resource for many solvings of each puzzle. Original, unique letter squares provide enjoyment while puzzlers improve familiarity with Scripture.